The translation of this page isn't yet complete. Until it is, unfinished parts use the English original. The Deskbar is the little panel that by default is located in the upper right corner of the screen. It's Haiku's version of Windows' taskbar with its Start button. 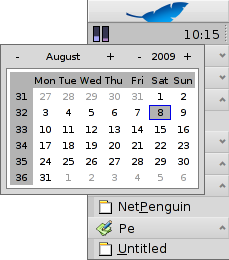 It contains the Deskbar menu from where you can start applications and preferences, a tray with a clock and other tools below that and a list of currently running programs at the bottom. You can move the Deskbar to any corner or as a bar along the upper or lower border of the screen by gripping the knobbly area on one side of the tray and drag & drop it into the new position. 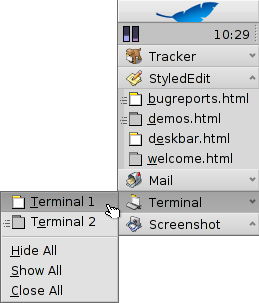 You can also fold it into a more compact layout by drag & dropping the knobbly area onto the Deskbar menu. A wider Deskbar allows for more icons in the tray on a single row. 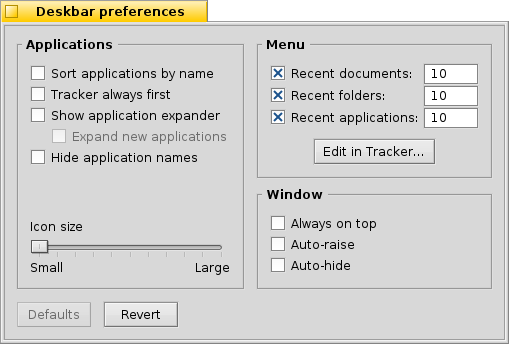 It also truncates longer application names in the list of running programs less often, especially if you use larger icons. About this system... - Shows some basic information of the system, licenses and the credits of the Haiku project. Find... - Opens the Query dialog. 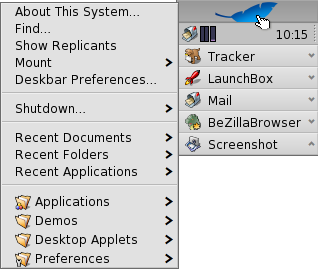 Show replicants - Shows/hides the little Replicant widget you use to drag it around, remove or access its context menu. Mount - Offers the same options as when invoked by right-clicking the Desktop (see Mounting Volumes). Deskbar preferences... - Opens a panel to configure the Deskbar (see below). Shutdown - Offers options to either Restart system or Power off. Recent documents, folders, applications - List of the last recently opened documents, folders and applications (see Deskbar preferences below). Applications, Demos, Deskbar applets, Preferences - List of installed applications, demos, applets and preferences. You can add links to other programs (or any folder, document, query etc.) by putting them into ~/config/settings/deskbar/menu/. The Deskbar preference panel is devided into three sections. The following settings don't apply to your installed applications, but to the behavior and visuals of the list of running applications. Sort running applications Sorts the list of running programs alphabetically. Tracker always first Even if you sort alphabetically, the Tracker entry always stays first in the list. Show application expander Provides a small widget to show/hide all windows of a program directly under its entry in the Deskbar. Expand new applications Newly launched programs have their windows automatically expanded under their entry in the Deskbar. Hide application names Removes the text labels of running applications. Icon size Adjusts the icon size of running applications. Here you can set the number of recent documents, folders and applications that are shown in their menu in the Deskbar, or if you want to see them at all. The button Edit in Tracker... opens the folder ~/config/settings/deskbar/menu/. In it you'll find the files and folders that appear in the Deskbar, by default these are Applications, Demos, Deskbar applets, and Preferences. You can delete or add entries like links to applications, documents or even queries by simply copying/deleting them to/from this folder. Finally, the preferences for the Deskbar window. Always on top The Deskbar always stays above all other windows. Auto-raise The Deskbar pops to the front if the mouse pointer touches it. Auto-hide The Deskbar is reduced to only a few pixels and only pops up if the mouse pointer touches them. Among other things, the tray is housing the clock. Hover the mouse over it to display the date in a tooltip. Left-click it to show a calendar. Right-click it to hide/show the clock or launch the Time preferences to set it. Any program can install an icon in the tray to provide an interface to the user. The email system, for instance, shows a different symbol when there's unread mail and offers a context menu to e.g. create or check for new mail. ProcessController is another example that uses its icon in the tray to provide information (CPU/memory usage) and to offer a context menu. You can change to a specific running application by clicking on its entry in the Deskbar and choosing (one of) its windows from the submenu. By right-clicking you can Hide/Show all windows or Close all and with them the entire application. A SHIFT CTRL click on an application hides all its windows, a CTRL click shows them again. Sometimes an application may hang and even though all its windows are gone, the entry in the list of running applications in the Deskbar just won't disappear. In such a situation you use the Vulcan Death Grip to get rid of it: hold SHIFT CTRL ALT and click on the offending entry in the Deskbar. Fascinating! If you activated Expanders in the Deskbar settings, you can expand/collapse the list of windows directly under an application's entry. In front of every application's windows is a symbol providing info on its state. A bright symbol means a window is visible, a dark one that it's minimized. Three lines in front of a symbol shows that it's not on the current workspace.